Prospective musicians often decide on the violin as their instrument of choice. Playing the violin does offer numerous benefits. For starters, it produces a lovely sound, but it’s also a portable instrument making it a great choice for young students. In addition, many gifted musicians choose the violin as their musical partner, and the violin has a significant range for musicians who want to play a variety of genres. If you or a loved one is considering taking violin lessons there are a few tips that can make your experience easier and more enjoyable. Consider them before committing to an instructor or even to the instrument itself. And good luck in your adventure. Can You Commit? : The first step to learning any instrument is in asking yourself if you can commit to learning that instrument. 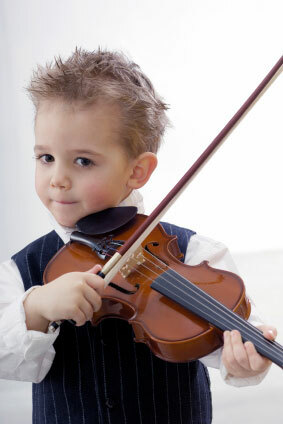 Do you or your child have enough time in the day to practice? Will you be able to attend your music lessons regularly? Will you be able to afford the payments on the instrument? Ask yourself these questions before committing, so that you avoid having to back out later because of time or financial conflicts. Tips for Finding an Instructor: Finding a violin instructor is an important factor in learning how to play the instrument. Begin by asking friends and relatives for recommendations of teachers in your area. After an initial phone interview, try to set up a time when you can meet to discuss teaching techniques and goals. In addition, you could ask to sit in on another lesson in order to get a better idea of what a typical lesson might be like. Make sure you choose a teacher that is a good fit for you or your student. Don’t Practice Bad Habits: In order to understand the violin and play it properly it’s important to steer clear from practicing bad habits. Be sure you listen to your instructor on how to properly hold the instrument, maintain the instrument and play it properly. Learning how to play and practice the right way will help you develop your skills faster. Be Patient: Learning a new instrument is never easy, and the violin can be a challenging instrument to learn. Be sure you or your student has the patience to stick with it until you begin to notice real progress. Keep Track of Practice:Committing to a regular practice schedule can help your child excel at this new experience. Provide a calendar for your child to keep track of his hours, offering stickers to mark off time spent playing the violin. Incentives will help your child enjoy practice sessions and make the most of the time. Offer positive encouragement to keep your child committed to practicing, and work with the instructor in order to prioritize your child’s time and effort. Experience an Orchestra:One of the best ways to encourage yourself to practice and develop as a musician is to experience what musicians can do after years of practice. Attend an orchestra performance in order to learn more about the violin and how beautifully an experienced violinist can play.